This is the second in our WOVEMBER two-part ‘closing the gap’ special, which featured Lesley Prior this morning and Finisterre this evening, talking from different perspectives about their shared project involving WOOL. This morning Lesley described some aspects of the work involved in growing the wool that Finisterre use for their apparel; we heard more from a farming perspective in the Growing Wool part of WOVEMBER and indeed for insights into the highs and lows of raising Bowmont Merino sheep, we honestly can’t recommend Lesley’s blog highly enough. But what about the processes by which this wool becomes something you can actually wear? To help us answer that question, Deborah Luffman at Finisterre agreed to do a Q&A with WOVEMBER about their work with Lesley’s wool. All the photographs accompanying this piece were taken by David Gray of Finisterre. 1. What makes Bowmont an especially suitable wool for Finisterre’s purposes? Bowmont is a durable fibre with an impressive micron count, making it ideal for Finisterre, a cold water surf brand. 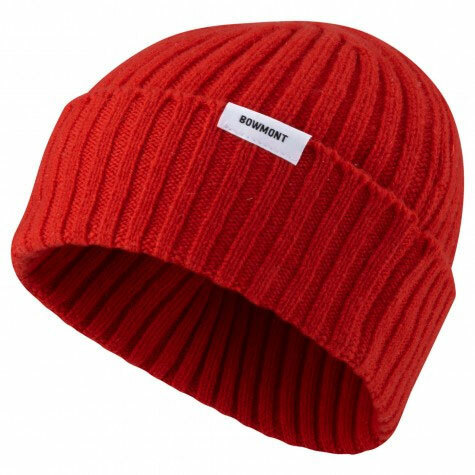 Bowmont is ideal for making wool beanies and jumpers, keeping our customers toasty after getting out of the sea, and there is the added benefit of its being naturally antibacterial. 2. Could you talk a bit about the products you have so far bought to market using Bowmont Merino grown by Lesley Prior, and the products you are currently developing for the future? Last year we produced the Bowmont beanie, a classic ribbed brim beanie and it went down a treat, this year we are adding a fishermen’s rib jumper to the range, and we have snug Bowmont socks under development. 3. What are the biggest challenges for a company when it comes to working with WOOL, and what are the biggest advantages? 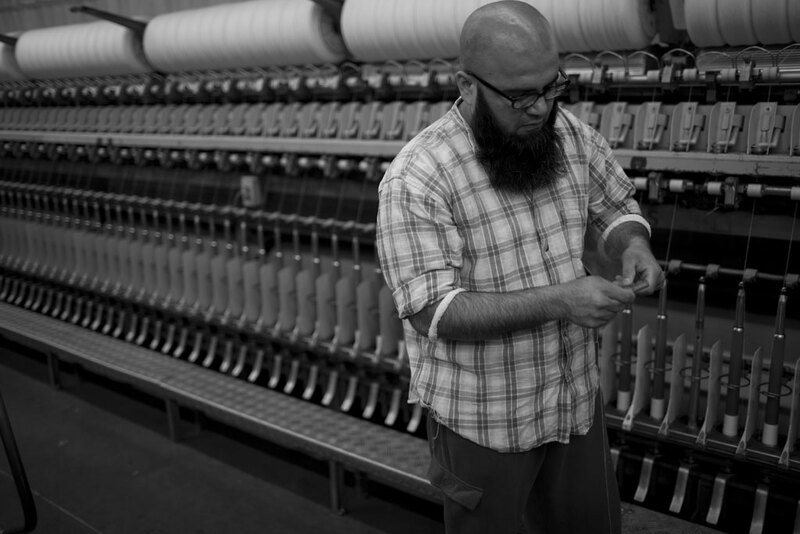 We love wool and we have it in our tees, our shirts, our knits and even our pants! From a customer point of view the advantages are huge – warmth, softness, antibacterial properties and breathability. From a supply chain point of view wool sets us some challenges, largely due to distance as we source our merino from Australia. We would love to source all our wool closer to home, but at present the Bowmont flock is too small to satisfy all our production needs. What we need are more Bowmont sheep and more incredible and passionate farmers like Lesley Prior! 4. Obviously this year WOVEMBER is focussed completely on this idea of “closing the gap”, i.e. informing consumers about the entire sheep to garment process… Would you be prepared to talk about the supply chain behind the Bowmont range, i.e. where the wool travels to and from and how it is turned from being Lesley’s sheep into being something you can buy to wear? And could you say a little bit about how the idea of “closing the gap” fits with the Finisterre brand and values? Is the idea of “closing the gap” something your company considers to be important? Absolutely; for us sourcing and developing fabrics which perform and enhance the lifestyle of the cold water surfer means searching for high quality and durable fabrics and we are committed to responsible sourcing. This means working from within the supply chain and sometimes creating chains from scratch, as with Bowmont. We support Lesley and buy all the fleece she grows year on year. Back in May of this we personally transported the bales from Lesley’s farm in Devon, driving the van to Delph in Yorkshire, where it was scoured and spun into yarn at Gledhills. The wool was then transported to Hawick in Scotland where it was dyed into hanks, and then knitted into fully fashioned garments. We feel that by being this involved in our supply chain we can tweak improve and learn about the process to improve our products. 5. What has the public response been to the Bowmont products you have so far made and sold, in terms of sales, and feedback from your customers? Last year was the first time we made commercial products from Bowmont and we bought a range of 250 beanies and 200 scarves and we sold through in 2 months in the period between November – early Jan. This year we have increased the knitted accessories to 350 pieces and have added 175 jumpers, which is again super tiny given the flock size and we expect it to sell through super fast, since we have had so much interest from our customers and press alike. 6. What differences can consumers make to support WOOL in the opinion of Finisterre? Buying it, looking after it, enjoying its benefits and spreading the word! 7) I’ve been very intrigued by the photo essays on the Finisterre website – in particular the one relating to R&D re: woolspinning! 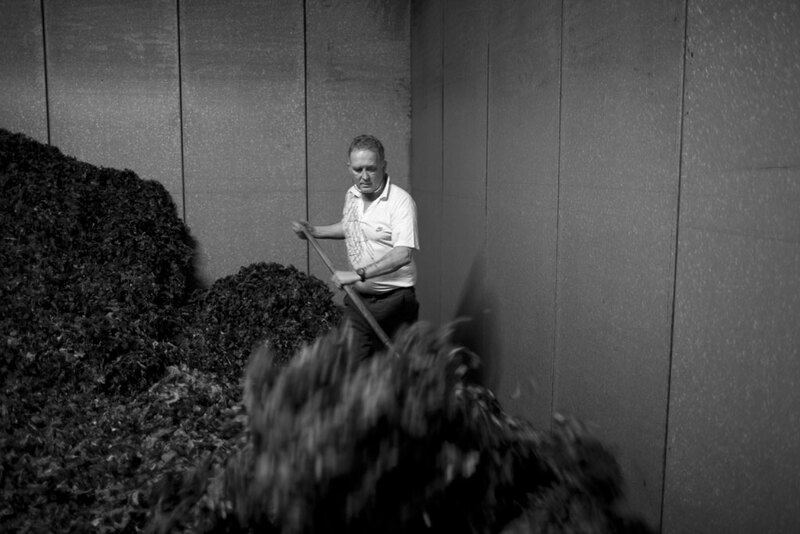 I wondered if you could talk a little bit about some of the photos in this essay? This photo was taken at Gledhills spinners, Yorkshire, it shows woollen tops being hand sorted into a specific colour shade after being blown through into chamber and prior to fibres being spun to make a heathered plyed yarn colour. Fresh cones are being prepared at Gledhills for a new spinning process, where several strands of yarn are spun at any time onto cones to produce plyed yarns which will be strong enough to go through knit machines. In this image – taken at Gledhills in Yorkshire – we are seeing the first results of the Bowmont yarn after being scoured, the fibre is still quite greasy and is yet to be combed and carded before it is ready to be spun into yarn, but already it feels soft and you can see the unmistakeable crimp – the wiggle of the yarn, which is related to its high micron count and soft qualities. 8. Finally, what do you learn at Finisterre from working closely with a shepherd? 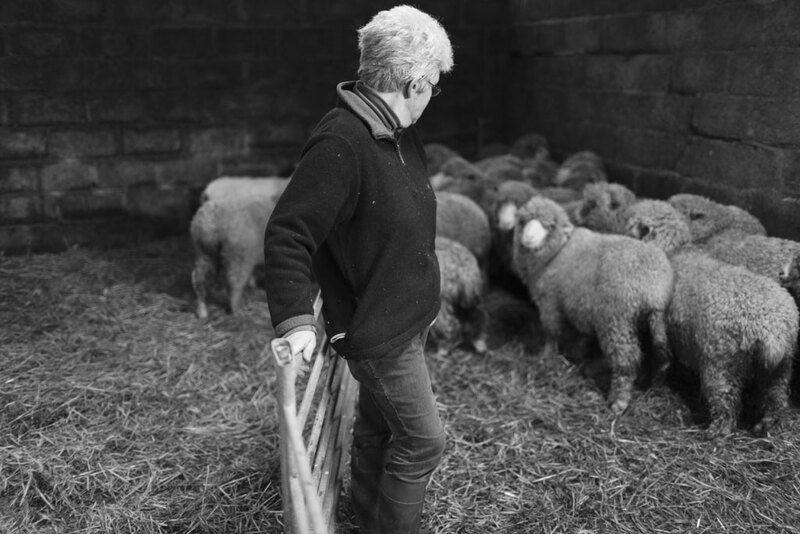 I knew nothing about sheep farming before I met Lesley and she has opened my world up to the complexities of line breeding, genetics and clarified questions around organic and micron count. I wish I could work this closely across all of our supply chain, and it has been invaluable in terms of educating myself and our customers. Many Thanks to David Gray and Deborah Luffman at Finisterre for answering our questions and supplying the photos and words for this post. All photos © David Gray and used with the kind permission of David Gray and Finisterre. Also – don’t forget – you have a chance of actually winning one of the Bowmont Merino scarves produced from Lesley’s Wool if you enter the WOVEMBER PHOTO COMPETITION!